All Donations Are Deeply Appreciated! As a small non-profit, we do our best to serve the Light to as many people as possible in various ways. This website and Blog Talk Radio are just a couple of the ways we try to reach as many people as we can, in addition to providing the physical location for gatherings, sessions and meditations. Our listeners and members are continuing to increase, and our services and resources need to grow along with our audience to provide the best spiritual pathways for all individuals. Work at our temple is not funded by United Way or any other large foundations. Grants for spiritual non-profit centers are not available and we do not receive any government funding. We survive on donations averaging about 10 to 20 dollars a month per individual. A donation of $100 today from every person who listens to our Blog Talk radio show or who has come into the Temple for a free class, event or support group would complete our fundraising for over a year! 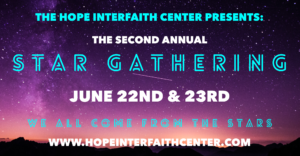 If you have been inspired and changed by a class at the Hope Interfaith Center, strengthened by a support group or enlightened by a spiritual service, please help us as best you can. If you have found our monthly, Blog Talk Radio shows important to your spiritual growth or just useful for your life, please take one minute to keep us going strong. Any amount helps us to continue this wonderful journey. Help us release fundraising from our focus so that we can put our energy into what we do best: Providing Love and Light from the ONENESS to you and to Planet Earth. Your donations are deeply appreciated and will be used to invest in our future programs at the Center and on our Blog Talk Radio programs. We only have three paid employees who serve many people around the world; therefore, your funding does not go towards a large administration cost. Your donations go directly to helping others. We are so grateful for your help!